Today in hockey history, a trade that definitely worked out for one team, a powerful defenseman is born, and a legendary player is traded whilst in his prime. July 11, 1935 – The Red Wings traded Cooney Weiland and Walt Buswell to Boston for Marty Barry and Art Giroux. The move paid immediate dividends for the Wings and for Barry, as he helped lead Detroit to two consecutive Cups (1936 and ’37). Giroux, on the other hand, played in the minors, and did not have his name engraved on the Cup. 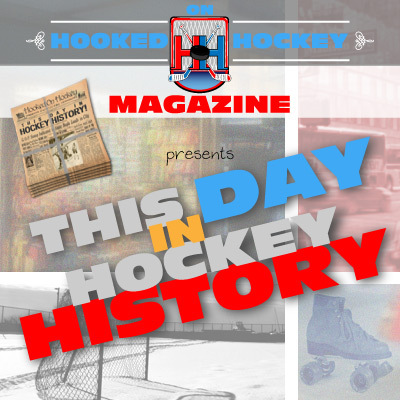 July 11, 1963 – Hall-of-Famer Al MacInnis was born in Inverness, Nova Scotia. MacInnis’s is probably best known for his ridiculously hard shot (and not his skating, which was, in fact, incredibly poor when he joined the league), which was so powerful that he once split goaltender Mike Liut’s mask with the puck (and then it went into the net)! I can’t find a video of that, but here he is actually putting a hole in the boards with a shot…in warm ups. He won the hardest shot competition in the All-Star skills competition seven times. And his shot clearly helped his offensive numbers: he’s one of four defensemen to have scored 100 points in a single season (1990-91) and currently sits third on the all-time scoring list at 1,416 points (his 340 goals are third). He had a super long career as well, playing 12 seasons with the Flames (they were in Calgary when he joined the league in 1982) and another 10 with the Blues. His #2 is retired in St. Louis and is honored in Calgary. July 11, 2001 – One of the greatest players in the game at the time, in his prime, was traded: The Penguins traded Jaromir Jagr (and Frantisek Kucera) to the Capitals for Kris Beech, Michael Sivek, Ross Lupaschuk and future considerations. Why would the Penguins trade a 29-year-old Jagr, you ask? Well, four years earlier, Mario Lemieux, the captain, had retired due to injury and cancer problems, so Pittsburgh opted to give Jagr the “C” and offer him a lucrative deal. Three years after retiring, though (and after being elected to the Hall of Fame), Lemieux came back to play. Pittsburgh, being a small-market team, could not afford both salaries, and the relationship of the two great players – as well as the relationship between Jagr and the fans, team, and ownership – began to worsen, as they ruled that Mario was the face of the franchise and should take back the “C”. Additionally, Jagr’s play had deteriorated, so the Penguins decided to trade him to Washington, where he played even worse.